For years, a severe tooth infection or a toothache meant you had to have a tooth pulled. Fortunately, with the advancements that have been made in dental technology, our team can help prevent an infected tooth from needing to be pulled. 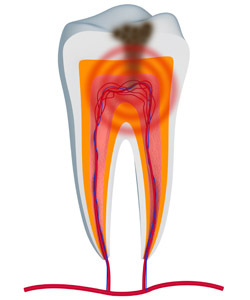 A root canal can put a stop to deep tooth root infections and help keep you from losing your natural tooth. Severe swelling of the gums around the base of the tooth. A toothache that keeps coming back or won’t let you sleep. Extreme tooth sensitivity that occurs with other symptoms. We take root canal therapy seriously because we want to help save your tooth. To keep your oral health in good condition, we will first get rid of the infected tissue, or pulp, as well as any decay. After decayed tissue and infection are removed, we will clean, dry, and seal the tooth to prevent it from getting infected again. For most patients, the next step is to have a dental crown made and bonded to the tooth for protection and strength. Your crown will be made of premium-grade porcelain that will not only blend in with your natural teeth but will protect your tooth as well. Root canals have changed the way we do dentistry, and has helped numerous patients keep their original teeth. We offer professional root canal services so you don’t have to suffer! You can experience pain relief in a safe and welcoming environment when you come to our office for root canal therapy. Do you have any other questions about root canals, root canal therapy, or about any of the other services we can provide? Contact our team today!